Letter from Duke of York. A LETTER from his Highness James Duke of Yorke, superscribed, "For Sir Harbottle Grimston, Speaker of the House of Commons," and subscribed "James," being dated at Whitehall, the 5th of June 1660, was this Day read. Ordered, That the humble and hearty Thanks of this House be returned to his Highness the Duke of Yorke, for his kind Letter, and high Expressions of Affection to this House. Resolved, That the Letter from his Highness the Duke of Yorke to this House be entered in the Journal of this House, as a Memorial of his Highness' Affection to this House, and of their humble and hearty Acceptance thereof. Resolved, That the Lord General be desired to signify to his Highness the Duke of Yorke, the grateful Sense this House hath of his affectionate Letter to this House. 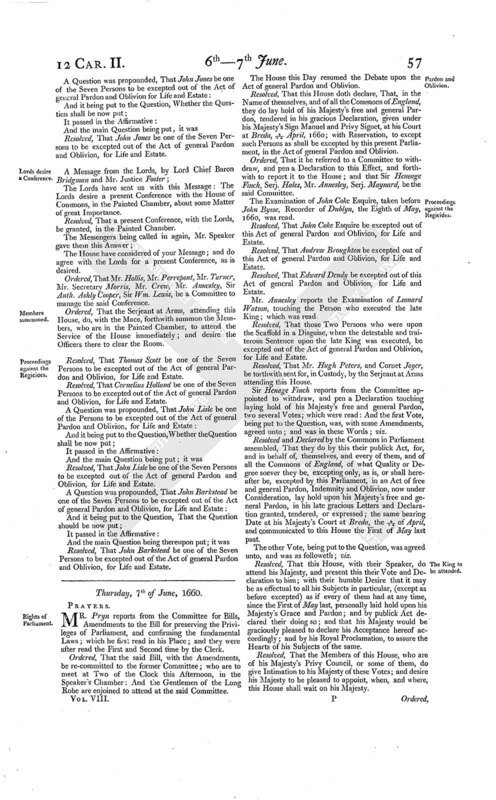 Resolved, That the Members of this House, who are commissionated and deputed by the Lord Steward of his Majesty's Houshold, to administer the Oaths of Supremacy and Allegiance, in his Absence, to the other Members of this House, do compare with the Roll of the Knights, Citizens, Burgesses, and Barons, returned to serve in this Parliament, the List of the Names of those who have taken the said Oath before the Lord Steward, or the said Commissioners; and thereupon report to the House, what Members, returned to serve, have not taken the said Oaths; to the end it may appear whether any that have not taken the said Oaths do sit in this House. Mr. Annesley reports several Examinations, which he hath received from Ireland, concerning the late King's Death; viz. the Examination of Jo. Cooke Esquire, a Prisoner in the Castle of Dublyn; the Examination of Mary Lock, Wife of Richard Lock, of Dublyn; the Examination of Lieut. Sibthorpe Stammers; the Examination of George Purdon, of Ogonella in the County of Clare, Esquire; the Examination of Colonel Henry Pretty; and the Examination of Captain Wm. Howlett; being all taken before John Bysse Esquire, Recorder of Dublyn. Ordered, That the said Examinations be referred to the Committee to whom the Examination of Mr. Secretary Thurloe's Business is referred; to be by them considered of, and their Opinion thereupon reported to the House. Mr. Pryn reports from the Committee, the Examination of Wm. Lilly, touching the Person who cut off the Head of his late Majesty; and read the same in his Place. Resolved, That William Say be one of the Seven Persons to be excepted out of the Act of general Pardon and Oblivion, for Life and Estate. 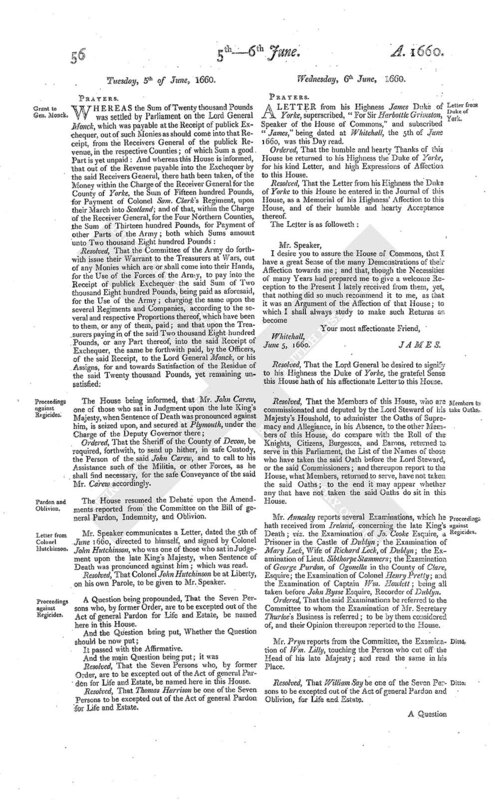 Resolved, That John Jones be one of the Seven Persons to be excepted out of the Act of general Pardon and Oblivion, for Life and Estate. The Lords have sent us with this Message: The Lords desire a present Conference with the House of Commons, in the Painted Chamber, about some Matter of great Importance. Resolved, That a present Conference, with the Lords, be granted, in the Painted Chamber. The House have considered of your Message; and do agree with the Lords for a present Conference, as is desired. Ordered, That Mr. Hollis, Mr. Perrepont, Mr. Turner, Mr. Secretary Morris, Mr. Crew, Mr. Annesley, Sir Anth. Ashly Cooper, Sir Wm. Lewis, be a Committee to manage the said Conference. Ordered, That the Serjeant at Arms, attending this House, do, with the Mace, forthwith summon the Members, who are in the Painted Chamber, to attend the Service of the House immediately; and desire the Officers there to clear the Room. Resolved, That Thomas Scott be one of the Seven Persons to be excepted out of the Act of general Pardon and Oblivion, for Life and Estate. Resolved, That Cornelius Holland be one of the Seven Persons to be excepted out of the Act of general Pardon and Oblivion, for Life and Estate. Resolved, That John Lisle be one of the Seven Persons to be excepted out of the Act of general Pardon and Oblivion, for Life and Estate. Resolved, That John Barkstead be one of the Seven Persons to be excepted out of the Act of general Pardon and Oblivion, for Life and Estate.